NETWORK FINALS: BIG BROTHER gained 0.1 in final numbers, while the SUPERGIRL rerun lost the same. CABLE HIGHLIGHTS: VH1’s BLACK INK CREW led Wednesday cable, up a tenth to 0.60, with MARTHA & SNOOP’S POTLUCK DINNER at 0.35/0.28 compared to last week’s 0.32/0.26. TLC’s illustrious DR PIMPLE POPPER (recently renewed for a new season) dipped 0.06 to 0.53. On Bravo, REAL HOUSEWIVES OF NYC lost 0.04 to 0.42, and the season premiere of REAL HOUSEWIVES OF DALLAS was at 0.27. Paramount’s YELLOWSTONE was down 0.02 to 0.40. MTV’s CATFISH gained 0.02 to 0.33, and ARE YOU THE ONE was at 0.25/0.24. On USA, THE SINNER ticked up to 0.30, and SUITS also ticked up to 0.28. MSNBC’s RACHEL MADDOW SHOW led cable news at 0.29/0.46/3M, with Fox News’s HANNITY at 0.25/0.48/3.2M, and CNN TONIGHT at 0.22/0.31/1.2M. TBS’s FULL FRONTAL slipped 0.03 to 0.28. On HGTV, HOUSE HUNTERS INTL rose 0.03 to 0.28, HOUSE HUNTERS shrank by 0.02 to 0.26, and PROPERTY BROTHERS was down 0.06 to 0.25. On ID, BROKEN TRUST dropped 0.04 to 0.26, and REASONABLE DOUBT was down 0.04 to 0.21. Food Network’s GUY’S GROCERY GAMES ticked down to 0.24. OWN’s QUEEN SHGAR ticked up to 0.22. A&E’s BORN THIS WAY was at 0.14/0.13, and RAISING TOURETTE’S premiered at 0.10. 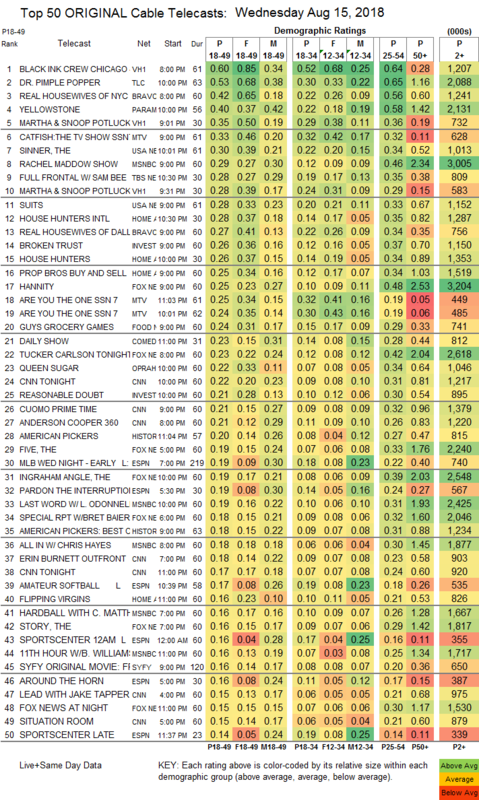 On Lifetime, KIDS WHO KILL was at 0.11, and the CASEY ANTHONY’S PARENTS special was at 0.11 as well. 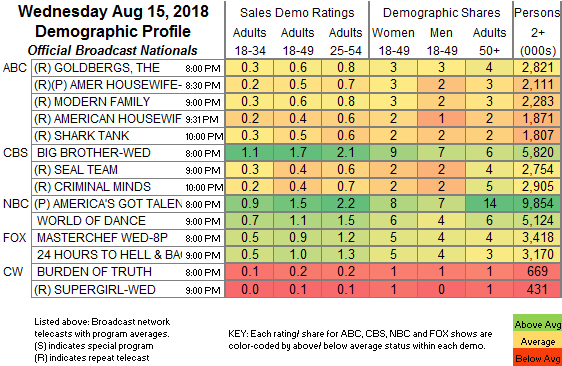 Freeform’s ALONE TOGETHER was at 0.05/0.05 compared to last week’s 0.04/0.03. El Rey’s LUCHA UNDERGROUND was down 0.01 to 0.02/97K.